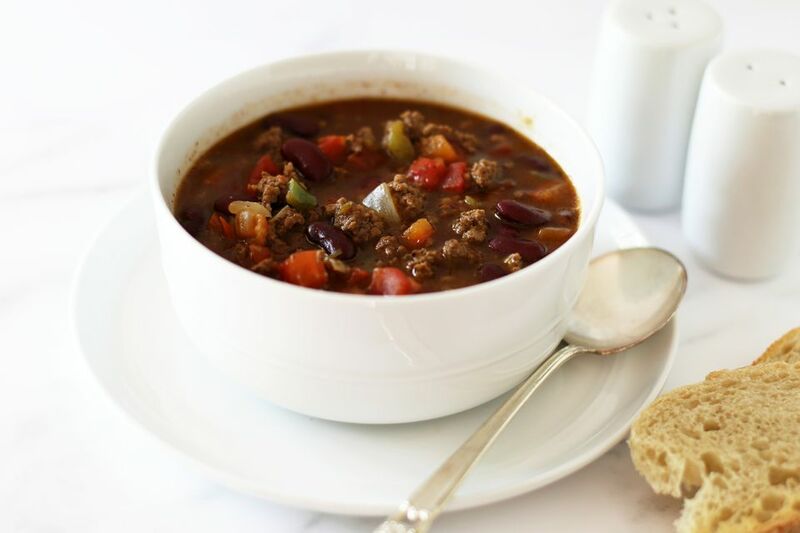 This hearty ground beef soup obtains its great flavor from chili seasonings, peppers, and tomatoes. The soup offers a beefy, slightly thickened broth and all of the great ingredients you'll find in your favorite chili. Like many soups, this one is quite versatile. Add extra vegetables to the soup if you like. Corn is an excellent option for both flavor and color, or add about 1/2 cup of diced carrots and simmer the soup until they are tender. Or replace half of the beef with sliced sautéed mushrooms. The recipe calls for kidney beans, but feel free to replace them with black beans, pinto beans, small red beans, or great northern beans. And there are many different kinds of tomatoes in supermarkets. Use fire-roasted or chili seasoned tomatoes, or make the soup with basic diced or petite-diced tomatoes. If you like spicy flavor, add a small amount of cayenne pepper when you add the chili powder. The soup is excellent with cornbread or crusty bread, or serve it with a topping of tortilla strips. Make it a day in advance if you'd like. It tastes even better the next day, and it reheats beautifully. *The flour thickens the broth slightly, but you may omit it or replace it with 2 tablespoons of fine cornmeal or masa harina. Slice the bell pepper in half; remove the seeds and stem. Cut the pepper into 1/2-inch dice. Peel and mince the 2 cloves of garlic. Heat the vegetable oil in a Dutch oven or large saucepan over medium heat. Add the onion and ground beef and cook, stirring, for about 5 minutes, or until beef is browned and no longer pink. Add the diced bell pepper, minced garlic, flour, chili powder, and cumin. Stir to blend and continue cooking for 1 minute. Add the can of chili peppers along with the tomatoes and beef stock. Bring the soup to a boil. Add the beans and season with salt and pepper to taste. Reduce the heat to low and simmer for 15 to 20 minutes. Ladle the soup into bowls and sprinkle each serving with fresh chopped parsley or shredded cheese, as desired. Serve the chili soup with freshly baked cornbread or crusty French or Italian bread.